In the below examples of print ads, the University of Washington, Washington State University and University of Oregon use these strategies quite nicely. While we may be rivals on the playing field, let’s take some time to congratulate our competitors — and ourselves — on the advertising tenets that we successfully employ. The below ad from WSU features a clear message — in addition to the bright colors and bold lettering — that is easily absorbed and hard to miss. 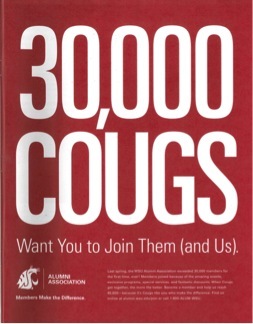 The ad grabs attention with the large font, but below it, WSU provides additional information in a smaller font that does not compete with the “30,000 COUGS” text. This ad deserves the full page of space that it takes up. 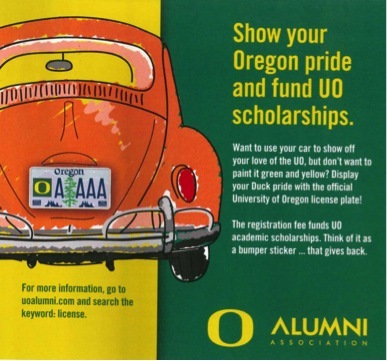 The below ad from the University of Oregon prompts the audience to “Show your Oregon pride” and “fund UO scholarships.” The “you” language helps the call to action feel direct, and the UO is explicit about how they want their audience to participate. They also provide a link and keyword to make it easy to follow through. 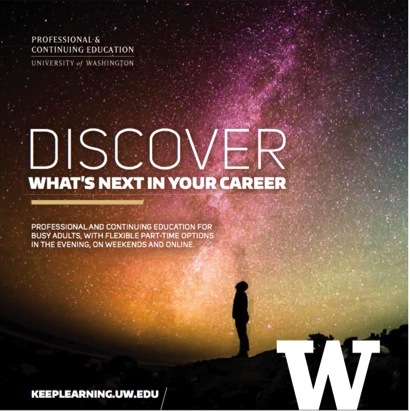 In this ad, UW Professional and Continuing Education (PCE) poses an action statement that is specific to their audience: “Discover what’s next in your career.” Found in Columns, the UW alumni magazine, this ad targets working professionals who are interested in furthering — or changing — their careers. The ad also promises the benefit of flexible hours, a common (but effective!) sales technique. The specific audience and benefits combine with the direct and motivational message to “keep learning”, which provides a reason why the reader should take action. Add the simple URL, and you’ve got an effective ad! The concepts listed above are the basics: They should apply to just about every advertisement. But depending on your purpose and audience, there are many other potential roads to take. You could focus on a specific appeal — like humor, fear, facts, etc. — for your audience. Or, for a more advanced approach, consider tailoring your message to your audience’s psychographics or highlighting a unique sales proposition. For more info on the UW’s ad presence, contact assistant director of the UW’s brand and media strategy Tory Hernandez!